Are you torn between different blind styles? Here’s how to select the best window blinds that perfectly match your home’s style. When it comes to furnishing a new home or redecorating, there’s no denying you have a lot of decisions to make. With home renovations costing, on average, more than $60,000 per home, there’s not much room for making the wrong choice on your new decor. One big investment will be your window treatments. Choosing the right ones to match your decor, darken your space, or increase your homes energy efficiency is a must. 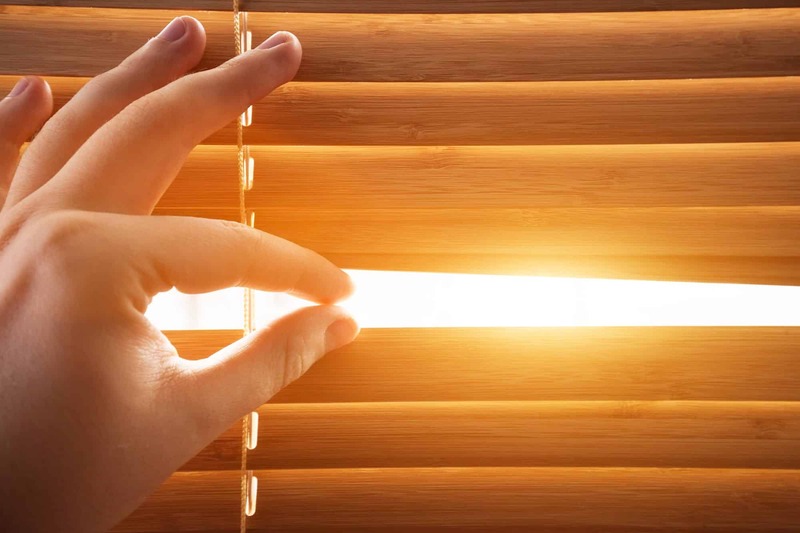 In order to choose the best window blinds for your home, you first need to know the many different types of blinds available. Keep reading to learn about 6 of the most popular window blind options on the market today. If you’re looking for an affordable, aesthetically appealing window treatment option, roller blinds are one to consider. Roller blinds feature a long piece of fabric that rolls up into the top of your window when not in use. 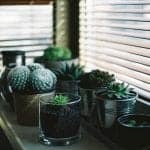 They are only as wide as the glass of your window, which allows them to blend into your decor better, giving your space a clean, minimalist look. But even though they look minimalist, these blinds block out your window entirely, making them excellent for privacy. One big benefit of roller blinds is how easily they roll up and down. No more worry about blinds bent out of place or twisted wires. These roll up and down with ease, making them ideal for windows you open and close regularly. Another benefit of roller blinds is how easy they are to clean. If you’ve tried other types of blinds and are sick of struggling to wipe away dirt and dust, roller blinds offer a welcome relief. Simply wipe the fabric clean with a damp cloth or run a vacuum over them. Venetian blinds might be a popular classic style, but they are also great for adding a modern touch to any room. Rather than blending into your decor like roller blinds, Venetian blinds stand out, adding character to your space. You can choose from natural wood Venetian blinds, stained or painted versions, or those made from other materials. Because these blinds are thicker, they offer a great deal of privacy. But with just a quick flip, they can be opened to let in light and ventilation. Don’t worry about these heavy treatments blowing in the breeze when windows are open. Clips keep them locked in place so that you can still enjoy some fresh air. For a more luxurious look, as well as uninterrupted views out your window during the day when the blinds are open, Roman blinds are a great choice. Roman blinds are fabric blinds. They are available in a range of colors and fabric options, including blackout curtains to darken a room even in the middle of the day. When lowered, Roman blinds form a solid backdrop, with clean, modern lines crossing them. When raised, Roman blinds pleat themselves neatly, tucking themselves discreetly at the top of your windows, giving you maximum viewing area. Because they can extend below the bottom of your window, Roman blinds offer greater light blocking than other blind types. Panel glide blinds are lightweight fabric blinds cut into individual panels. They hang vertically in long strips and slide to one side or the other when closed. When closed, the panels stack for an easy-to-operate blind. Lowered, panel blinds create a seamless-look that blocks light and provides privacy. Like with Roman or roller blinds, you can choose from different fabrics and thicknesses. 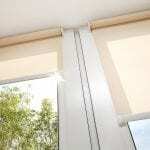 Choose light filtering for a thinner blind that lets in sunlight but provides privacy when closed. Or go for a darker fabric or blackout fabric for less light. Because they are lightweight and affordable, panel glides are often a popular choice for sliding glass doors and large windows. They can be easily cleaned or individual panels replaced if they become damaged. Panel glide blinds offer a similar look to the next type of blinds on this list, vertical blinds, but at a more affordable cost. Vertical blinds look a lot like panel glide blinds. But instead of being made from fabric, vertical blinds are made of more durable materials. These materials make cleaning vertical blinds much easier than panel blinds. But if you damage a blind, the repair costs will be higher than a panel blind replacement. But vertical blinds are still one of the most cost-effective blind options on the market today. Because they hang vertically and feature large panels, vertical blinds are popular for big windows and sliding glass doors. They are lightweight and simple to open and close. When open, they tuck neatly on one side of your doors or window to help maximize your viewing area out your window. Cellular blinds, also known as honeycomb blinds, are one of the most popular types of blinds on the market today. They offer a clean, modern look. They are available in hundreds of colors, including many room darkening options. The number of honeycomb layers determines how much light can get in, as well as how much heat or cold air can get in or out. You can choose from single honeycomb, double, or even triple honeycomb options. One of the biggest benefits of cellular blinds is that they are very energy efficient, especially when 2 or 3 honeycombs are used. As with Roman blinds, when cellular blinds are raised, they pleat neatly at the top of your window for a clean look and a wide viewing area for your window. Any of these window blinds options can be a great addition to your home. To pick the right one, you’ll need to consider your decor style and colors, whether you need room darkening abilities, and how much traffic each window will receive. If you’re still not sure which are the best window blinds for your home, check out this article next for a few window blind ideas for showing off your living room decor.